Click photo for the new booking agency, at www.FirstChoiceMusicians.com. We are very excited to announce a new company that has been launched for the purpose of booking union bands and musicians for weddings, corporate parties, bar mitzvahs and other events. The company, First Choice Musicians, will feature a state-of the-art web site (FirstChoiceMusicians.com) that will present quality video and audio clips in order to solicit customers to hire musicians and bands in the greater New York area. First Choice Musicians will present on its web site highly polished and edited videos that will showcase bands and acts in the best possible light to show potential clients and bookers what First Choice Musicians’ artists can bring to any gathering where music will add that special element to make the occasion unforgettable. All engagements booked through First Choice Musicians will be covered by Local 802’s single engagement club date collective bargaining agreement. In order to be part of First Choice Musicians’ roster, you must provide photos, bio of the act, band size, music genre(s), a sample song list and audio clips. 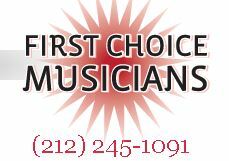 For more information and to apply to be a First Choice Musicians band or musician, call (212) 245-1091 or e-mail Info@FirstChoiceMusicians.com.